October 15, 2018 – Amidst a real storm in the Florida panhandle and a tornado of political activity all over the country as the midterm elections quickly approach, we took time out recently to visit the Cleveland Clinic in Cleveland and the Medical University of South Carolina (MUSC) in Charleston to see our investment in the Parkinson’s Foundation Centers of Excellence program come to life. Both facilities are at the leading edge of the diagnosis and care of Parkinson’s and related movement disorders. They provide a single facility for patients to see neurologists, occupational therapists, speech therapists, and all the related specialties, easing the care process while providing a remarkable research data gathering opportunity to utilize in research for a cure. The Cleveland Clinic facility houses some remarkable cutting-edge technology on movement disorders and provides telemedicine opportunities for interim patient contact. Care in door width, corridor size and easy front door parking access make this a special one stop place for Parkinson’s patients to get all their needs addressed in a single visit. After the designation ceremony and tour, we dined with Cleveland area supporters in the evening to discuss what we have been doing and what lies ahead. 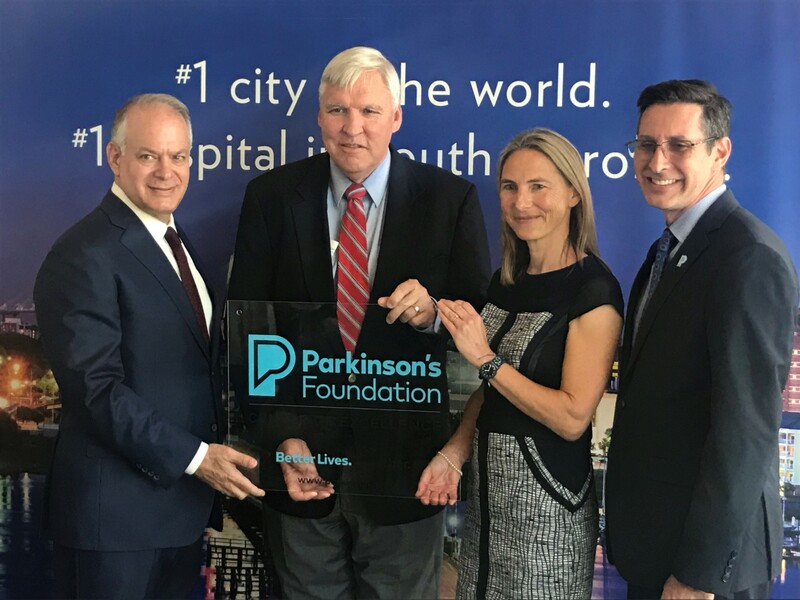 The next morning, we flew to Charleston, South Carolina with professionals from the Parkinson’s Foundation team to name the next Center of Excellence at the MUSC, housed at the James Clyburn Research Center. That night at dinner, a local leader who has been living with Parkinson’s said that the same drugs have been used to treat the symptoms for the last forty years. This comment made clear the need for far greater urgency in our push to change the trajectory and timing of progress in understanding the cause, care, and eradication of this disease. University President Cole said we all had chosen to be there for the plaque unveiling. When I stood to speak, I differed and said that none of us came by choice, but instead were chosen by having people we care about get diagnosed. I never planned to engage in this fight, but when the President of our company got the call to say she had Parkinson’s, there was but a single path forward, to go all in to try to make a difference at an accelerated pace. At the end of this week we head out for a day and a half to Las Vegas to name one more Center of Excellence at the Cleveland Clinic Lou Ruvo Center for Brain Health. The next morning, we will walk with in the Las Vegas Moving Day event before coming back home. We look forward to keeping the pressure on to keep progress driving forward on a cure and better care. If former Vice President Joe Biden can create his “Moonshot” project to cure Cancer, why can we not do the same for Parkinson’s. Regular people from every walk of life have been diagnosed as have leaders like President George Bush, Governor Ed Rendell, Senator Johnny Isakson, Alan Alda, Neil Diamond, Jesse Jackson, Brian Grant, Linda Ronstadt, Jerry Lewis, and the list goes on endlessly. Senator Cory Booker’s father and former Attorney General Janet Reno all had Parkinson’s. It seems everywhere I go, someone has a friend or relative who received that same call, and there are many more that have the condition and never have seen a doctor for it. Doing something is not a choice, it’s an obligation to those for whom we care who had the bad luck to be diagnosed and for those not yet diagnosed. Many thanks to all of you have helped. A massive federal funding of research is what it will take to have our own Moonshot. It’s time to start talking to our elected leaders about making this funding a priority in every state and in our federal budgets. If we can send a man to the moon, we surely can find a cure for Parkinson’s.